The St. Petersburg-Clearwater and its surrounding areas are home to some of the world’s best and most beautiful beaches. From the crystal clear water and white, powdery sand of Clearwater Beach to the superior fishing and rich history of Fred De Soto Park, there is a beach here for all types of people. On your next trip to Tampa if you are looking for a great place to spend a day of sun, sand and surf take a look at some of the area’s most popular beaches and state parks so that you can decide which one best suits you and your family or friends. Whichever one you choose, you won’t be disappointed. To get to your hotel by the sea make sure you book a ride from the airport to get you there quickly and without a hassle. You can find shared ride vans to most of the hotels in the area or if you are looking for a little more style than a limo or sedan might be a better option for you. Florida is the first thing which comes to mind when we think of summers and associated fun. The whole state becomes a party place when the warmth of summer’s hits the country. Tampa Bay Area in general and St. Petersburg, in particular, are serious tourist attractions when it comes to beautiful scenery. The city of St. Petersburg is so majestic in its views that it is termed as the Sunshine City. Exotic resorts, luxury hotels, vast beaches, warm waters, and restaurants serving amazing food are some of the many reasons this city is known for. It is also famous for golf courses, fishing points, and multiple water parks. St. Petersburg city, as well as the other places in Tampa Bay Area, are served by PIE International Airport when it comes to air commute. Situated in the outskirts of the city, it is at a distance of no more than 9 miles from St. Pete’s downtown. This means that you have an easy access to the airport no matter which part of the city you’re from. 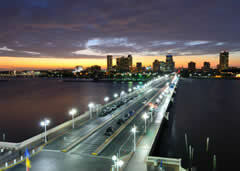 Along with serving the locals of St. Pete, it serves adjoining areas like Clearwater, Largo, and even Brandon as well. The airport is surrounded by a network of roads which joins it with all the nearby cities and their outskirts. Apart from its proximity to the cities of Tampa Bay, the quality of the services and swiftness of the process also furthers its values among the locals as well as among those coming from outside the state. St. Pete-Clearwater International Airport is quite a ways from downtown St. Petersburg, which is already a city that’s not too big. Getting a ride ready after you land is still a good idea, though – reserve a shared ride van and hop on for a cheap ride to your hotel, wherever that may be. Enjoy the company of strangers and relax as all the work is done for you. St. Petersburg is known for having some of the unique museums, from the surrealist glass-paneled Salvador Dali Museum to the antiques and contemporary statues of the city’s Museum of Fine Arts. Have everyone in your group, if you have one; check out the amazing district by scheduling a pick up with a private van by allowing you to get in touch with history of local and of the world. If you’re looking for a natural space where you can spend a day relaxing by yourself or with someone you love dearly, Fort De Soto Park is a good place to do that. Visit by driving in one of our sedans, hopping from island to island in a car and space of your own, giving you the opportunity to see one of St. Petersburg’s famous sunsets along the beautiful interconnected roads that streamline across the water. Grab a bite to eat at a local burger joint and have a picnic at Jungle Prada Site, a beautiful park that is home to plenty of docks and places to look out as you enjoy your meal. Reserve a private SUV so you can go there whenever you want, taking the car to other great locations afterward like the Kenwood Historic District, a beautiful neighborhood filled with interesting houses and streets designed for relaxing strolls, whether it be on foot or in your private SUV. Eat amazing steak at Parkshore Grill, a fanciful American restaurant that gives guests park views and upscale dishes that actually leave you full. Go on a relaxing drive through downtown to settle your stomach after dinner, reserving a pick up to make sure you’re arriving everywhere in style with one of their stretched limousines. Have a refreshing cocktail at Stillwaters Tavern, open all night and offering beachside beers, good social company, and an undeniably exclusive location. If you’re planning a group field trip and are wondering what everyone can do having fun, figure out the transportation so nothing gets in the way of all the fun. Reserve a chartered bus that everyone can get to great landmarks like Weedon Island Preserve together and without wasting time. If your group is more of an indoor crowd, visit the family-friendly Mahaffey Theater, a bayside venue for performing arts and fun musicals. Many travelers look toward the Orlando area as the place to be while in Florida but Tampa has a lot to offer also for your vacation. When you fly into the St. Petersburg-Clearwater International Airport or Tampa International Airport there are several beach destinations that you may want to consider visiting before you leave. Getting around between the Tampa, St. Petersburg and Clearwater areas all have highways connecting them with three bridges that keep the flow of traffic moving between Hillsborough County and Pinellas County. 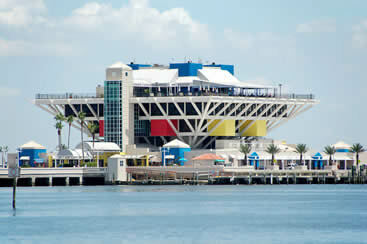 To get one of the quickest and shortest routes from Tampa to Clearwater you can use the Courtney Campbell Causeway. This scenic route that connects the two cities has 2 beaches and places you can rest at to enjoy the views as you cross. It has better routes to places such as Clearwater Mall, International Plaza and Bay Street as well as Tampa International Airport. Used as one of the main passageways between Tampa and St. Petersburg this route can be very congested during rush hours but does have direct access to the many of the businesses in the area including the closest to the St. Petersburg-Clearwater International Airport. You can drive across U.S. Route 92 on the waterway of Old Tampa Bay via the Gandy Bridge. As the closest bridge that connects Tampa and St. Petersburg it has convenient access for those wanting to travel to and from MacDill Air Force Base. 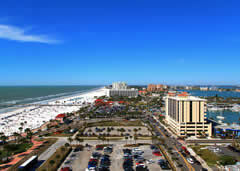 Among the best of the beaches surrounding the Tampa Bay area is Clearwater Beach. 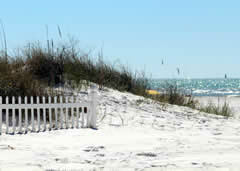 It has some of the softest sand along the Gulf coast and is popular among local beach volleyball players. With dozens of popular hotels along the beach such as the Adam’s Mark Clearwater Beach Resort you can discover a paradise that can make your visit an enjoyable summer visit. 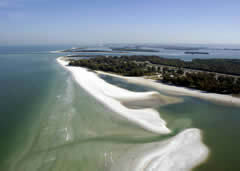 Unlike many of the beaches in the Tampa area with Caladesi Island State Park you will need to take a local ferry from the Dunedin Causeway, for example, to the island. 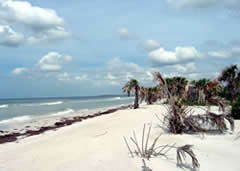 This is a very private secluded tropical beach that is about three miles around. If you are looking for a hidden gem, you’ll want to put this beach on your list of places to visit while you are in town. This family friendly park has plenty of sandy beach areas for you to soak up the sun during your visit. Since the park is located in Tarpon Springs near the well known Tarpon Springs Sponge Docks, you can make a quick visit to the many shops on Dodecanese Boulevard where you can discover a large variety of sponges, soaps, souvenir and a museum called the Spongeorama. You can even take boating and fishing trips from the docks for a perfect day on the open sea. Located on a barrier island, this unique park is a favorite among those looking for a more relaxed camping trip vacation for their. With a designated place to ride bikes, fishing piers to kick back for the day hoping to hook the big catch or view real mortars from previous bases and historic sites from the days of Robert E. Lee in the mid-1800’s.